Join today and get two exclusive enamel pins! As 2018 comes to a close, the Free Software Foundation (FSF) is preparing to explore new frontiers in software freedom -- with your help. This has been a year of significant challenges for the free software movement, but also incredible opportunities. One-time gifts we received this year totaling $1.8 million will enable us to fund and initiate more projects than ever, but we need the consistent support of ongoing and new Associate Members to see these efforts through, and to take our movement to the next level. We appreciate everything you've done for software freedom. Will you take the next step and propel free software to new frontiers by joining for as little as $10 per month ($5 per month for students), or making a donation? We want to celebrate 400 new Associate Members during our annual fundraiser. You can also join on a yearly basis for $120. By signing up for a yearly membership before the end of the year, you can receive a set of enamel pins, including the FSF logo and one of our favorite gnus! If you prefer to donate in Euro, please email business@fsf.org for the details. This year, the world saw even more evidence that the technology people use intersects directly with their freedom and privacy, often for the worse. We saw another unsurprising revelation that Facebook is a massive walled garden that profits by its lax attitude toward user freedom and privacy. There was continued overreach of copyright law, to the detriment of free software developers and users alike, including when the European Copyright Directive passed, threatening software freedom by limiting the ability to upload reused code. The Federal Communication Commission (FCC) voted to gut net neutrality protections in the United States. The Commons Clause was created, confusingly turning free licenses into nonfree ones. The Spectre and Meltdown vulnerabilities were exposed, and brought renewed attention to the ongoing threat of the Intel Management Engine. But dark times offer great opportunities, especially when like-minded people work together for a common cause. The FSF was lucky enough to receive two large donations from the Pineapple Fund and Handshake this year. Unexpected funding like this is a game changer for the movement -- with it, we are able to expand our work, with plans to expand our staff and provide significant funding for several key free software projects. However, the support of our Associate Members and donors in the community is still indispensable. Associate Members provide the most long-term, stable financial support for the FSF. This giving sustains us through difficult times, and our stalwart base shows major donors that the FSF has the confidence of thousands of supporters worldwide. Your trust in us encourages others to lend a hand, too. That's why we're so grateful to our supporters. The Associate Member program launched in 2002, and sixteen years later, we're closing in on 5,000 current Associate Members -- more than ever before. This is evidence that the free software community is growing and more active every day. Makers of Respects Your Freedom (RYF) certified products are pushing free software to new heights. We're going to review a record number of RYF applicants. More companies are making products that respect user freedom, and leave control in the hands of the user, than ever before. These companies are at the forefront of making software freedom the standard, and the RYF certification program helps. Individuals like you are helping to push the boundaries of support for user freedom. We will organize opportunities for free software contributors and newcomers to connect and work together -- from our fresh Associate Member forum, to the annual LibrePlanet conference, writing and publishing on free software and free software related issues, and other days we come together to take action, like International Day Against DRM. 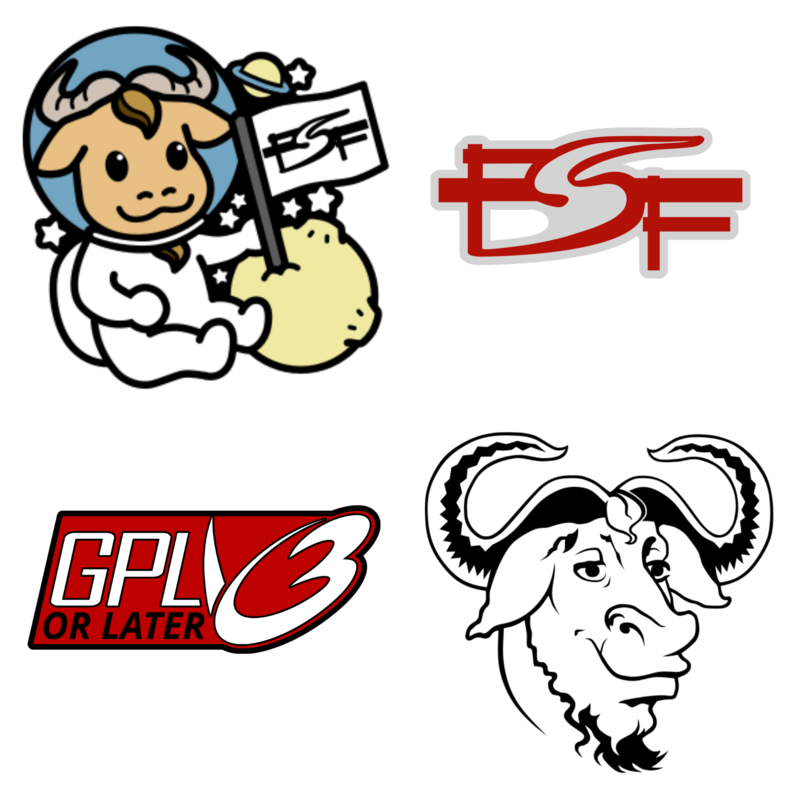 The FSF fosters the next generation of free software contributors and explorers through FSF internship programs. We send FSF speakers around the world. In 2018, FSF staff brought the message and knowledge of software freedom to five continents, speaking at events everywhere from Bristol, UK (Freenode Live) to New York City (Hackers on Planet Earth), and other locations including Hsinchu, Taiwan (DebConf) and Sydney, Australia (Linux Conf AU). We plan to keep this up in 2019, and help spread our message even farther. We help free software development, including GNU projects, reach new frontiers in software freedom by providing robust infrastructure. In 2018, we replaced approximately 50 servers with a new stack. GNUHope, and have about 50 left to migrate in the upcoming year. We carried out GPL enforcement activities in 2018, and are looking ahead to doing more in 2019. We also educated others about copyleft, restarting a seminar series on copyleft, updating licensing resources, and answering around 750 questions concerning free software licensing. If we work together, there's no telling what we can achieve in 2019. Becoming an Associate Member costs $10/month ($5/month for students). In appreciation, we offer Associate Members many benefits, including a bootable USB membership card loaded with the FSF-endorsed GNU/Linux distribution Trisquel, a digital member button, member.fsf.org email aliases and Jabber instant messaging, gratis admission to the annual LibrePlanet conference, a 20% discount on all purchases in the FSF shop, a printed copy of the biannual FSF Bulletin, 5% off hardware from ThinkPenguin, access to the FSF Associate Members forum, and more! And remember, all new and renewing Annual Associate Members between now and the end of the year may opt to receive a set of enamel pins as a thank you for their membership. You can trust that your donations will be used efficiently: our Charity Navigator rating is four out of four stars, with a score of 100% on accountability and transparency, and 95.97% on financial management. Our commitment to using free software in our operations demonstrates that a nonprofit can thrive without relying on proprietary systems. We're hoping you'll help us to blast off into orbit, as our community grows and its message of software freedom spreads to more people and more areas of computing. Thank you for supporting the Free Software Foundation today. P.S. Your employer may match your charitable contributions, and the FSF generally qualifies for these matches. Our EIN is 042888848. US federal employees can support the FSF through the Combined Federal Campaign. Our CFC ID is 63210, and you can pledge until January 11, 2019 for the current campaign period.